I-20 The primary east/west trucking corridor for the southern United States borders The Hub’s north boundary. I-35 The NAFTA Trade Corridor, runs 3 miles to the west of The Hub. 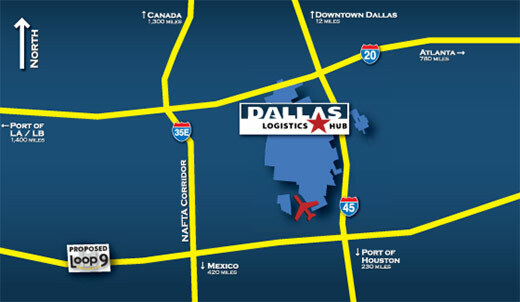 I-45 The direct route to the Port of Houston is adjacent to The Hub’s eastern boundary. Proposed Loop 9 The proposed multi-billion dollar highway and rail corridor will run along the south boundary of The Hub.